CHEREAU - Jerusalem comme elle est a present. CHEREAU, J. / AVELINE, P.A. - Jerusalem comme elle est a present. Jerusalem comme elle est a present. - CHEREAU, J. / AVELINE, P.A. Title : Jerusalem comme elle est a present.. Size : 13.4 x 20.4 inches. / 34.0 x 51.8 cm. 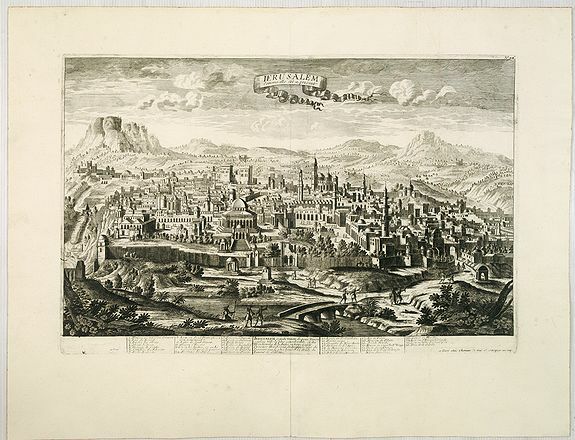 Description :A very decorative and extremely rare town-view of Jerusalem, including a numbered (1-36) key in lower part. Published by Jacques Chéreau, (1688 - 1776). Engraved by Aveline and first published in 1692 by Crepy, here the rare Jacques Chéreau re-issue, with a re-worked plate, of ca.1750. The numbered key and address re-worked " à Paris chés Chéreau rue St. Jacques au Coq." and plate number "96" added in upper right margin.